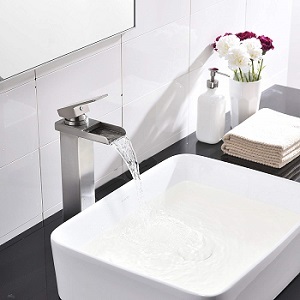 Are you thinking about installing a stylish bathroom sink in your new house? Or maybe upgrading an existing bathroom? If this relates to you, consider something that gives your bathroom the edge and a sprinkle of luxury. Vessel bathroom sinks add timeless appeal and provide unwavering functionality to your bathroom. Additionally, the bathroom sink that you choose should be easy to maintain and clean and should not be susceptible to clogging or grime/dirt stains. There’re many other things to consider when searching for the best bathroom sinks. Most importantly, you need to keep in mind that every bathroom is different, so you need to get the best option for your bathroom. Here is a quick look at our top 10 picks of the best bathroom sinks which will help you narrow down your options. 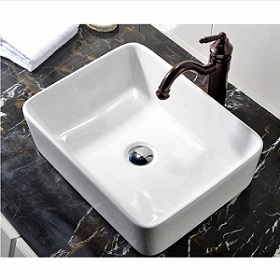 KINGO Home sink is an excellent above counter sink vessel made from ceramic in admirable oval shape. It’s a simple but elegant design that transforms your bathroom’s decor to a higher level. The sink measures 13L x 6L x 55H inches and comes with a 1.75-inch drain-hole at the bottom center. A quick glance will reveal a sleek finish vessel sink with a glossy non-porous finish to prevent any form of leakage. It’s also highly durable and scratch resistant, meaning that it will serve you for several years to come. Installing this fixture is also pretty simple. And the final product delivers nothing short of an amazing modern look and feel in your bathroom. 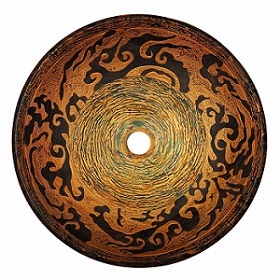 If you’re an artistic homeowner, this fixture will definitely catch your eye at first glance. With a center drainage hole, it provides maximum drainage leaving no water standing in your vessel. 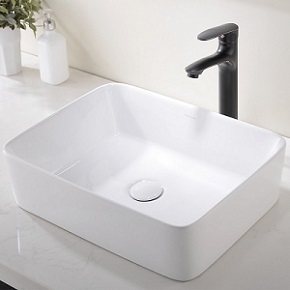 Overall, the KINGO Home ceramic sink is a high-quality sink vessel suitable for those looking for a modern and yet tasteful look in their sweet bathrooms. The Luxier bathroom sink is yet another true luxury sink ideal for stylish, modern bathrooms. It takes on a contemporary design that was inspired in Europe. The slanting square shape prevents any water spillage. If you’re in for an oversized sink vessel, you will love this piece. This sink is constructed from high-quality ceramic material, meaning that it will serve you for years to come. Other than being durable, the fixture is smooth enough to allow for easy cleaning. You have an option to choose from Oil Rubbed, Chrome, Bronze pop-up drain or the Brushed Nickel. 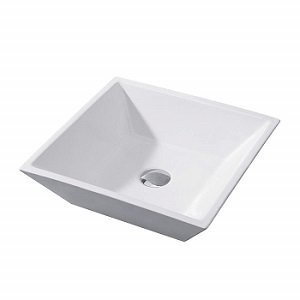 The Luxier bathroom sink currently comes in dimensions of 16-inches (Width) x 16 inches (Depth) x 4 inches (Height). Each order comes with a 2-year warranty so you can order with peace of mind. 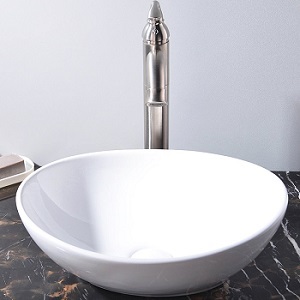 This artistic vessel Sink comes in a European style with a sprinkle of luxury and a reminiscent of the past. The sink is made from high tempered glass and comes in a round shape with a center drainage hole. The fixture measures 16.5 inches in diameter and 5.75 inches in height. For its countertop installation and retro design, it makes a great focal point to liven and refresh your bathroom. It’s an excellent functional and decor fixture great for home, restaurant, villa spa or other commercial use. The drain, faucet, and mounting ring are bought separately. Overall, the Aquaterior Vessel Vanity Sink is a unique fixture for those looking to set their bathrooms aside and introduce a fresh look. This is yet another great vessel sink made from high-quality tempered glass. The material is highly resistant and can withstand the heavy day-to-day usage. In fact, it can sustain more than 350 F degree. This glass vessel sinks are individually handcrafted making each piece relatively unique. Enbol GS-G0440 has unique striking beauty, specifically designed to accentuate your bathroom and create a striking focal point. 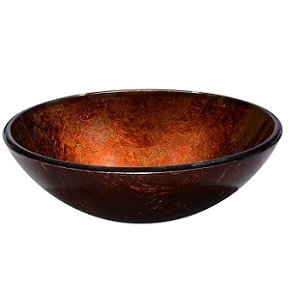 The thick round bowl has a shiny, smooth interior. The color selection and style are carefully selected so that the soap and water spots remain virtually invisible. The company designs their sinks following the US plumping standards, making it easy to install. The central drain hole works with any standard drain, so future replacement is a convenient swap. The Enbol bathroom sink is refined craftwork with outstanding quality. The KES rectangular bathroom sink is an excellent option for someone looking for contemporary, sleek design and smooth above-the-counter installation. The porcelain vessel is made from super-quality ceramic that promises a long lasting shine and resistance to corrosion and scratching. The center drain system also offers maximum drainage ensuring that water drains out efficiently and quickly. This beautiful porcelain vessel doesn’t require any faucet holes or wall mounts. It’s quite easy to install as it comes ready with installation instructions. The premium construction has just the right size of 19 inches (length) x 14.8 inches (width) x 1-inch (height). The vessel comes in a whole shape, meaning no seams or leakages. The bright, clean look can match a sunny bathroom or offer a sufficient contrast to a darker, vibrant colored bathroom. The vessel’s rectangular shape has rounded curves that accentuate it, giving is a smooth, Nordic look and unique style. The curved, smooth corners also prevent accidental injuries. Comllen waterfall is a company that believes better quality makes for a better life. They have every small line of products. This allows them to focus on delivering on their promise of high quality on every item they produce. The Comllen above counter basin is a beautiful rectangular bathroom sink. It sits a generous five inches above the countertop. It’s deep enough to do the job but not so tall as to be a problem. This is one of the best bathroom sinks because it looks far more expensive than it is users especially enjoy the visual appeal of the oversized drain button. 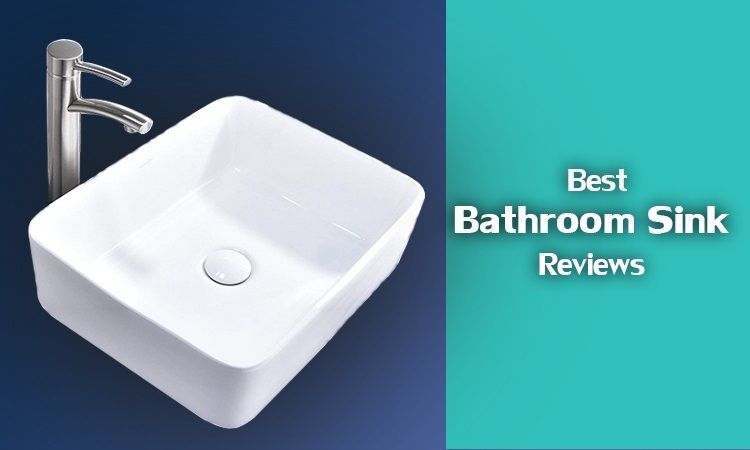 It’s an easy-to-install basin that instantly transforms the look of any bathroom for the better. The porcelain is hard-wearing, resists stains, and is easy to clean. It’s superior to glass sinks in that wipes clean with no trace of hard water spots or other marks. If the above counter sinks aren’t quite your style, you may find Kohler’s Caxton sink the perfect pick. The style is a bold, sleek take on the traditional oval-shaped basin. And, with interior dimensions of 17″ x 14″, there’s plenty of room to handle most at sink tasks. Many prefer an under counter sink, as it can make countertop cleanup easier. Buying the Caxton sink can also help with bathroom upkeep. The vitreous china enamel resists scratches, stains, and wear. Though the etched-in Kohler logo is only subtle visible, the superior quality of this bathroom sink is quite apparent. Its versatile style makes it suitable for both traditional and modern design. With a luxurious look and a budget-friendly price, this sink keeps buyers more than satisfied. Above counter sinks continue to grow in popularity. Those with rectangular shapes usually grant more room than round or oval basins. 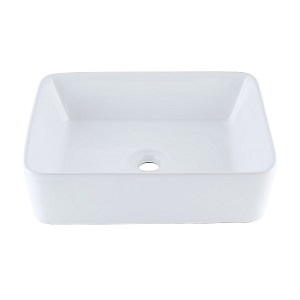 This Vccucine rectangle is one of the best bathroom sinks for its size, quality, and price. There’s a lot that the Vccucine and the rectangular above counter sinks have in common. In fact, they’re almost identical. The difference is that the Vccucine is slightly heavier and comes at a slightly higher price. This is the sink for those who want the best of the best in affordable above counter sinks of this shape. Vccucine has gone that extra step in the design of this sink, making it a bit more robust than the rest. That’s no surprise considering the impressiveness of their state-of-the-art facility. Many users love how great a value this sink is for its teeny price. It continues to inspire some to leap into remodeling their bathrooms. The silicone-free installation process is easy, making this sink a great choice for DlYers. Although the above counter style is remarkable in itself, sometimes you need to up the dramatic effect. The unique shape of this Decor Star is perfect for making a bold statement with your design. Still, what makes this one of the best bathroom sinks is its quality and value. The Decor Star CB-006 is far from ordinary. It’s well suited to the modern contemporary design style. If you’re looking for a sweet mix of fanciness and functionality, this is it. Some luxury basins leave much to be desired because they’re so small. That’s not the case with the CB-006. It’s a roomy, oversized 21.2 x 20.9 x 10.5 inches. Bathroom sinks like this one normally run around $300. This Decor Star costs well under $100 but isn’t lacking in quality. You’ll find it to be heavy duty, easy to clean, and made to last. Some shoppers always want to go for the lowest price. Sometimes saving money means sacrificing quality, but the Ufaucet porcelain is as luxurious as its pricier competitors. It’s the cheapest bathroom sink on this list. With the Ufaucet, you get to enjoy the beauty of a high-end above counter rectangular sink at a budget-friendly price. This ceramic sink is made with double fired vitreous china for superior durability. It’s easy to clean and you won’t have to worry about stains. Users find the Ufaucet essential to making their bathrooms look extraordinary. As it sits five inches tall, there’s no worry of splash back. This size is great for a bath, but it’s a real amenity in half baths. Ufaucet is a brand with an impressive line of products. The company specializes in offering high-end solutions at very approachable prices. This affordable, high quality above the countersink is a prime example of what the brand is an about. Choosing the right bathroom sink isn’t always easy. Hopefully, this list gives you a jump start. Just imagine how great any one of these high-quality sinks will look in your bathroom. When redoing your home bathroom, you want something better than the standard sinks commonly found in apartments and budget-friendly hotels. The right bathroom sinks for residences offer style as well as durability. Their adequate space makes for an enjoyable wash-up experience. Many bathroom sinks look the same but come at a different price and are made by different companies. It can complicate the shopping process by presenting a clear choice elusive. A bit of in-depth research can go a long way in helping by highlighting what makes each product stand out from the rest. Whether replacing your bathroom sink is a repair or an upgrade, you want to shop smart. Some people pay hundreds for a sink because they think it’ll give them a better outcome. This list proves them wrong. You can create a luxurious bathroom at a fraction of the price many pays. These sinks offer the same designer look that’s featured in top interior decor and home remodeling magazines. It’s intriguing what installing a brand new sink can do to overhaul the style of a bathroom. It’s no doubt that the market is full of bathroom vessel sinks featuring various designs and styles. Selecting the best bathroom sinks on the market, therefore, can be quite a challenge, but since we’ve narrowed down to the top 10 choices should be much more transparent. As you can see, we’ve tried to include a variety of shapes, sizes, design, material, and price range. So whether you’re looking for a contemporary modem vessel sink or a classic retro look, our recommendations will suffice.